Today I spent a few hours organizing for next year — creating the appropriate folders and creating/updating mailing lists. The process is interesting, because I think that the way one organizes their desktop, or their mail folders, or anything, reveals a lot about the person. How they view their world, how they compartmentalize it. Clearly you can see that I save a lot of emails; I’m a packrat in the electronic world as well as the material world. I’m definitely a natural archiver, because I have no memory and I need things written down to refer to. But there’s another reason why archiving email is important: you have written proof that certain things got done. “You never told us X,” a student or parent or dean or someone might say. “Actually, I told you that! See this here?” I will respond. Maybe this should be a meme. 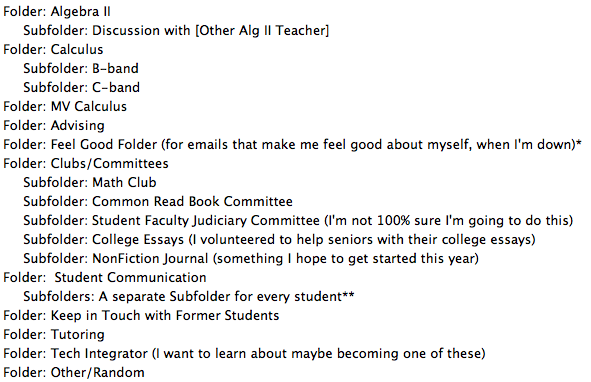 If you care too, share on your blog how you organize your school-related email? What do you save? Why do you save? *This is a new addition! I read about it on some blog and thought it was a great idea. Hm, how many students do you have? Somehow I don’t see setting up 120 folders, one for each kid. I just have a folder called Students0809 (for this year) where I dump everything. Then if I need to refer back to emails about a specific kid, I just run a search for their name and it pops up all the related emails. It works fine for me. Otherwise my folder structure doesn’t look much different from yours. I have a few additional ones, like “schedules”, where I throw things like music lesson and other schedules that tell me when kids are excused from class, and “professional development” where I keep correspondence related to workshops and the like. Oh, I have a lot, lot less. (Which makes it easier to deal with.) Last year I had about 50. But there was also ridiculous amounts of email, and I started throwing them in different folders based on the classes the students were in. Some students had 100+ email messages in their folders, by the end. (Others had only three or four.) But my school’s email program isn’t good for searching so I *had* to make separate folders. Maybe I should also say that the way one organizes their email folder says as much about the school as it does about the teacher, too. Hmm. I’m with Kate, I can’t see having a folder for each student. I do like your system though. Mine isn’t quite that organized: 0809_Students, MathTeam, StudentCouncil, Grad_School, everything else just stays in the inbox. Although I do archive quite often (low storage quotas). I really wish my school email account had the ability to add tags. Now that would be useful.